We can get caught up measuring the value of our apostolic works by the standards of efficiency, good management and outward success which govern the business world. Not that these things are unimportant! We have been entrusted with a great responsibility, and God’s people rightly expect accountability from us. But the true worth of our apostolate is measured by the value it has in God’s eyes. To see and evaluate things from God’s perspective calls for constant conversion in the first days and years of our vocation and, need I say, great humility. The cross shows us a different way of measuring success. Ours is to plant the seeds: God sees to the fruits of our labors. And if at times our efforts and works seem to fail and produce no fruit, we need to remember that we are followers of Jesus… and his life, humanly speaking, ended in failure, the failure of the cross. Welcome to St. Patrick’s Cathedral! Once you entered those doors on Fifth Avenue, you became an official New Yorker! But you already had a home in our hearts and souls. This Cathedral is in the middle of mid-town Manhattan. Geographically, and spiritually, we are here in the heart of New York. 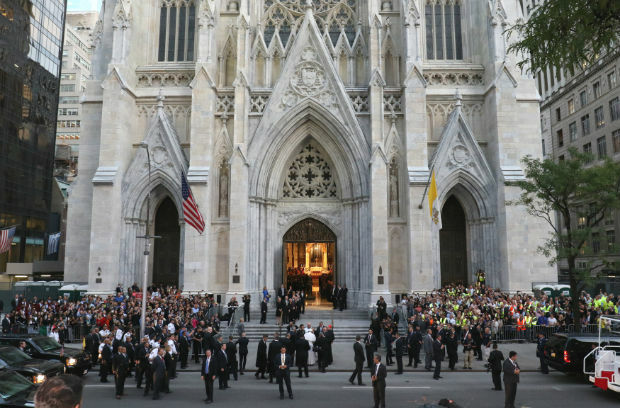 Since 1808, New Yorkers, and people from all over the world, have come to St. Patrick’s Cathedral – to the old Cathedral at first, and since 1878, here – to pray, to cry, to rejoice, to sense God’s love, grace and mercy. This evening our bishops, priests, deacons, religious sisters, and brothers, our lay leaders, our civic officials, our friends and neighbors, have come to pray with and for you. For the past three years, we have all worked hard to repair, renew, and restore our beloved St. Patrick’s Cathedral, thanks to the generosity of many people here. We have seen this repair and restoration as an invitation from Jesus to the spiritual renewal of ourselves and His Church. Your presence this happy evening renews all of us, and provides a special blessing to all our work for the Cathedral we love. NEXT: People come first, human life is sacred, pope insists at U.N.